Now in its twelfth year Love Parks Week is a time to showcase what parks have to offer, to celebrate the very best green spaces, to encourage everyone to get out and enjoy them, and to share with the world why you love your park and why parks matter to you. It's hoped that this wave of support helps to protect them for future generations. Get involved with Love Parks Week. "New research, published by charity Fields in Trust, reveals that regular parks and green space use makes a significant economic contribution of £34.2 Billion to the UK’s health and wellbeing." 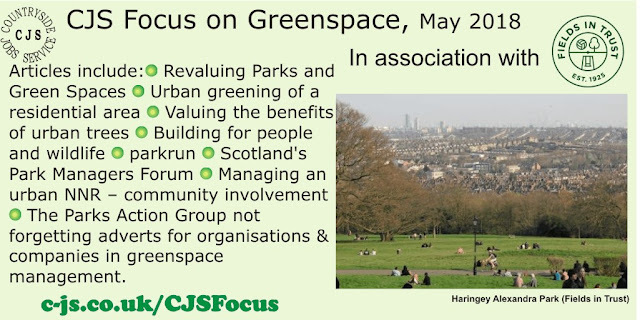 This is how Fields in Trust open their lead article in our recent CJS Focus on Greenspace. Read this edition online here. Southway Housing owns 180 green spaces in Manchester; find out how they have enhanced these areas for the local community. Forest Research would like to see more towns & cities using i-Tree Eco technology to put a value on the benefits of urban trees. The Wildlife Trusts believe that all new housing developments could & should be places where people & wildlife flourish; find out more about their latest campaign. parkrun is a great way to increase utilisation of & income for green space – read about Rushmere parkrun. greenspace scotland set up the Scottish Park Managers Forum - a way for professionals to network and learn best practice across Scotland. The management of an urban National Nature Reserve can be difficult at times, discover some of the challenges from the Senior Warden at Wren’s Nest NNR in Dudley. The Parks Action Group hopes to support those trying to provide a sustainable future for the UK’s green spaces. This edition also carries adverts for training, support organisations and companies in greenspace & countryside management. Read it here.